Follow the exploits of the young and intrepid ninja HAYATE in a fantastic and exciting (not to mention hilarious) animated adventure set in feudal Japan. A classic arcade LD game from the 80's brought back for the new 32-bit generation. NINJA HAYATE is part of the two-disc release「INTERACTIVE MOVIE ACTION : TIME GAL & NINJA HAYATE」. However, I think both games are relevant enough to deserve separate entries. NINJA HAYATE was originally released on the game centers back in 1984 during the notorious LD game boom period. 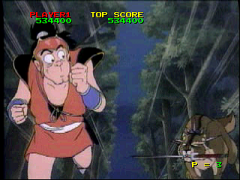 The game was designed specifically to be the Japanese counterpart to the original smash-hit LD game「DRAGON'S LAIR」, and just like it, the game was very successful at the time. However, due the posterior lackluster performance of the LD format in the west. NINJA HAYATE along with a few other Japanese LD games never got to see a proper overseas release. 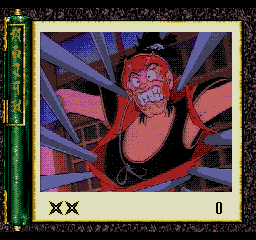 And that was very much the case until 1993 when the game was released on the SEGA MEGA-CD as「REVENGE OF THE NINJA」 a conversion done by the fan-favourite studio「WOLF TEAM」whom also brought the rest of the popular TAITO and DECO LD games to the system. Unfortunately, the conversion itself was pretty lousy. 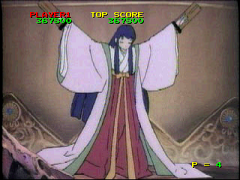 Unlike other noteworthy WOLF TEAM LD game conversions like「TIME GAL」and「ROAD BLASTER FX」, which at least had something unique going for them. 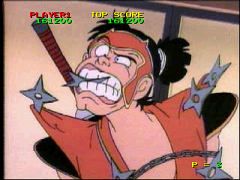 REVENGE OF THE NINJA was just a plain and rather poor video quality conversion. But at least something good came out of it, since not long afterwards a game company named「ECSECO」decided to replicate WOLF TEAM's LD game conservationist effort by releasing the same LD games, but this time on the more capable new generation 32-bit systems. The original 1984 game flyer. 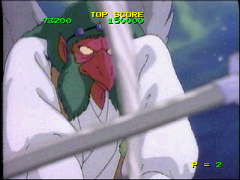 Of course it's worth mentioning that the ECSECO 32-bit renditions weren't still quite up to par to the original LD versions in terms of video quality. Yet to this day they remain the most faithful console conversions available nonetheless. A beautiful princess has been kidnapped by an army of demonic ninjas -- What better scenario for an aspiring heroic ninja of legend to prove his worth? Of course the quest ahead won't be an easy one. And our daring but inexperienced hero will better put his ninja reflexes to good use if he expects to rescue the princess from the clutches of these bloodthirsty monsters. NINJA HAYATE offers a lengthy animated adventure. In fact you had to play the original arcade game at least three times if you wanted to try all of its 18 available stages. Fortunately the 32-bit versions lets you choose between the original「ARCADE」and「LD」stage patterns. Tasukete Onegai ! ! ! 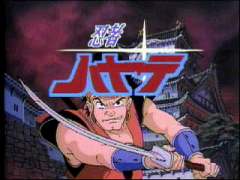 Like most of the other Japanese LD games, NINJA HAYATE was animated by the ultra prestigious TOEI ANIMATION studio. The animation of course is simply top-notch and a real joy to watch. 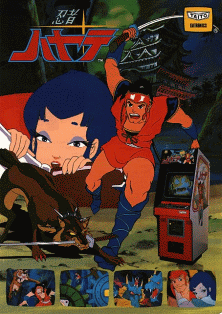 Specially if like me, you're fan of the distinctive animation style of the 80's. Personally, I think the late 70's and the 80's (maybe even the very early 90's too) were the golden era of animation. So one of the reasons I like these LD games so much is because I just can't get enough of the wonderful animation style of those times. 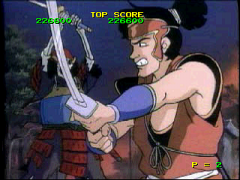 As previously mentioned, NINJA HAYATE was basically the Japanese equivalent of DRAGON'S LAIR, and as such it pretty much set the standard for the rest of the Japanese LD games that came after it. Sure, NINJA HAYATE wasn't the first Japanese LD game released, but it was definitely a genre defining title as far as the Japanese side of it is concerned. Even by 1984 a lot of LD games still felt more like a mere LD video footage that was put together in a hurry and in a poor attempt to try to pass it as a video game. 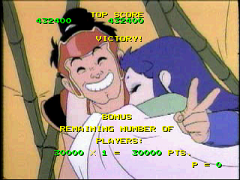 In my opinion there are 3 arcade LD games that everyone should play regardless of how they feel about interactive movie games : ROAD BLASTER, TIME GAL, and NINJA HAYATE. 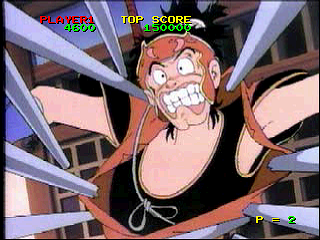 And while NINJA HAYATE doesn't offer the same non-stop action tour de force experience of the other two games. It still delivers a funny and entertaining action adventure that's bound to please most any animation fan out there. cool post! i've played time gal and road avenger, but i didn't know about this game!